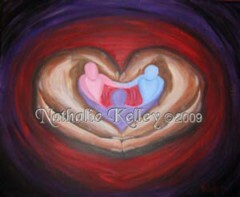 This was painted in Midland at the Celebration of the Hearts, a fund raiser that benefited Mission Messiah. The scripture emphasis was from Malachi 5:6 “See, I will send you the prophet Elijah before that great and dreadful day of the LORD comes. 6 He will turn the hearts of the fathers to their children, and the hearts of the children to their fathers. The Father’s hands emerge from the darkness in the shape of a heart. The Father’s hands are painted using all the colors of flesh. Cradled in the hands are 3 forms: blue for the sons, pink for the daughters, and purple (the combination of blue and pink) for the earthly fathers. Their arms overlap each other also forming a heart. This is a two-edged message. Not only is God turning earthly father’s and children’s heart toward each other but as His spiritual sons and daughters, He is turning our hearts to Him. The Hebrew word for turning means “to return home again”. Let’s return to Him!